This essay is about the AP photo wire, J. Paul Getty, the murder of Lee Harvey Oswald, Punky Brewster, the Challenger Space Shuttle, attack dogs in Alabama, teevee, our favorite new technology, the World Wide Web, and eventually theory of collective political action. It suggests that perhaps the political power of older, more static visual media might surpass that expressed in our current use of the internet. Two interconnected purposes of visual media connect that funny list of nouns in the paragraph above. The first purpose is to provide information to curious people. Media, the stuff that some people create and reproduce in hopes that other people will look at it, is successful when it provides either many people with information or provides some people with particularly interesting, insightful, or accurate information. We use the visual media to get better informed, that is smarter. Second, media has the capacity to inspire emotional response in us. Sometimes we look at an image, or read an article that moves us to joy, or to anger. We like to feel as much as we like to think. It is precisely the combination of information and emotional potential that has made visual media so important to the history of both collective consciousness and political action in the last two generations. Analyzing a very small piece of that history may convince you that a black and white photograph is better than the World Wide Web...sometimes. A stunning exhibit entitled Pictures for the Press just closed at Los Angeles' most palatial museum, the Getty. The selection of photographs reveals the importance of the Associated Press' Wirephoto service during and after World War II. It features a small number of iconic pictures that almost every person visiting had already committed to memory. The AP's photo service changed the way Americans received information, understood the world, connected to each other, and ultimately acted to shape society. The machine that allowed this change is about the size of a laptop from 1993 with a funny looking drum sitting on top that seems part Star Trek rolling pin, part seismograph. Its function is much the same as a scanning fax machine, allowing a user to transmit visual information, a photograph say, over tremendous distances by way of telephone lines. The Associated Press constructed a singularly comprehensive network of these machines across the world that allowed newspapers in Milwaukee, Albuquerque, or Honolulu to print full page pictures of the destruction of Nagasaki, , and the murder of Lee Harvey Oswald within 24 hours of those events. The wire service also ensured that the same picture would appear in Atlanta, Los Angeles, and Boston as well as every small town in between. Because the AP was so efficient and effective, our national memory of the thirty years beginning with the bombing of Peral Harbor is largely shared and held together with a few photographs that everyone knows. 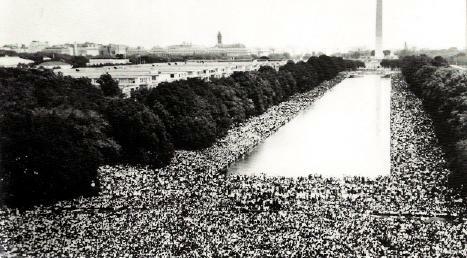 Two generations removed, when we think about the civil rights movement we see an image of dogs or fire hoses unleashed on Black Americans in Birmingham or else we recall the face and arm of Martin Luther King Jr. stretched out over the crowd from the Lincoln Memorial. When we think about the death of Lee Harvey Oswald the view of his lean body clenched in pain behind the thick form of Jack Ruby jumps to mind. When we try to understand the violence of nuclear war it is easy to call up the awesome image of a mushroom cloud over Nagasaki. The point here is that we know these moments visually because of the AP photo service. One or two images of complex events would go out to the world as representations. Newspapers, often devoting a third of their space to AP photographs, repeated the images creating icons, and those icons have shaped how people make sense of the world. Years later we are the heirs of not only these images, but the understanding that the icons allowed people to create. The relative importance of the AP photo service for distributing information and shaping our understanding of the world has diminished in the 30 years following Oswald's death. Television was on the rise even in the sixties, and in my childhood teevee was certainly the medium by which most people received most of their information. However, the teevee did not fundamentally change the way people in the United States learned about the world. A few networks of broadcasters arranged for a limited variety of images to reach a tremendous number of people. In 1986 I watched the same footage of the Challenger's destruction that my parents did. They watched on evening news what I saw a month later on the most poignant of Punky Brewster episodes. Our visual memories are the same, and both match with the clips you can see archived today. The historical images of the eighties are moving, but remain iconic. The internet has changed the way people access visual information and in doing so has reshaped the way our nation creates memory and altered how we take, or do not take, collective political action. In place of a single news service that provides most people a single view of the world's events the world wide web offers many people access to a myriad of perspectives and images. There is no single picture that stands for Hurricane Katrina, the U.S. invasion of Iraq or either of the Sox's wonderful World Series wins because all of events in the last five years have been transmitted and recorded over the internet. When nytimes.com reports on an event they offer a dozen pictures, an article, and an interactive map, as well as a choppy video clip of A.O. Scott if the story is even remotely related to the film industry. None of those productions are the same as the image I can find on Democracynow.org or Foxnews.com, not to mention the countless sites with smaller audiences who are now able to report on events from all over the globe. The results of this diversity of visual information available on the internet are two. First, I am better informed because I have more to look at, and therefore more ways to think about the events of the day. Second, you and I are no longer creating a similar visual record of the world because we are not necessarily seeing the same things. We do not share a memory of events from the most recent years in the same way we do events from 50, 30 or even 10 years ago. The first result is undeniably good, enough said. The second result raises some questions however, about how we are defining a moral society and taking collective political action to achieve it. In creating and distributing multiple images of current events the internet may protect us from the destructive mob actions that were so well facilitated by iconic media images during McCarhty's witch hunts or Mao Zedong's Cultural Revolution. However, it may also force organizers and participants in today's social movements to create new ways to move our population to political action in favor of peace or justice. People take effective political action when they are well informed, emotionally engaged, and connected with other people. If we are only well informed we do nothing. If we are only emotionally engaged we do stupid things, and if we are not connected with other people we act alone, and lose. The iconic images of the mid 20th century provided Americans with all three of these qualities at once. The television images provided millions of people enough information about the war in Vietnam that they could judge for themselves its purpose, utility, and cost in human life. Similarly, the AP photo wire's pictures stirred sorrow and rage among people around the country for the injustices of Southern segregation. All the while, the commonality of Americans' visual memory of current and historical events allowed people to connect with one another. The power and pace of social and political movements in the 1960s owes something to the prevalence of photographic icons created by the media of the time. Given that we no longer rely on the photowire or the television for visual information it remains to be seen how social movements will create opportunities for people to share information, emotion and connection in order to take political action and win.